Professional Heavy Duty 5-Speed Pet Grooming Clipper for You! This pet grooming clipper is suitable for any pets, including dogs, cats, rabbits even horses and other livestock. Not only for small or medium animals at home, but also perfect for professional groomers! Your best choice of Pro Grooming Clipper on Amazon! Undoubtedly BEST! Turbo 5-speed power for you to tackle any coat. There are 5 speed from 5000 RMP to 7000 RMP. If you have no concept about it, you could compare with other alike products on Amazon, like Whal or Oster. You will know how quick the speed is. Definitely great help for professional groomer to clip thick hair. Cordless pet clipper is an inevitable trend as it really makes our work easier. Just charging 3 hours and you can use it for 4 hours uninterruptedly. This professional pet clipper can automatically shut off itself when the blade is overloaded. It will produce a buzz and LED screen will light up before shutoff. It reminds you to oil and clean the hair in the blade. The electronic component in the clipper will be seriously damaged if the clipper not shut off when overloading. So far, no professional clipper on Amazon has such advanced function. NO RISK PURCHASE ONLY HERE! You are covered by a full-refund policy within 30 days since purchase. We are so confident about the quality of our product. This is why we dare to do this to make all people have chance to try such premium product. We take the greatest pleasure to solve any problems for you! ?5-SPEED HEAVY DUTY Professional Pet Grooming Clipper-Notice: We update the package (adding two scissors based on original package) since March 8,2018. If your order is after March.8 2018 and still receive no scissors, please feel free to contact us for refund. 5 speed level are available to satisfy your different grooming need. Higher the rotation, more powerful the clipper. So far, such speed change profession pet clippers are all above $100. ?Long power supply with short charging time. 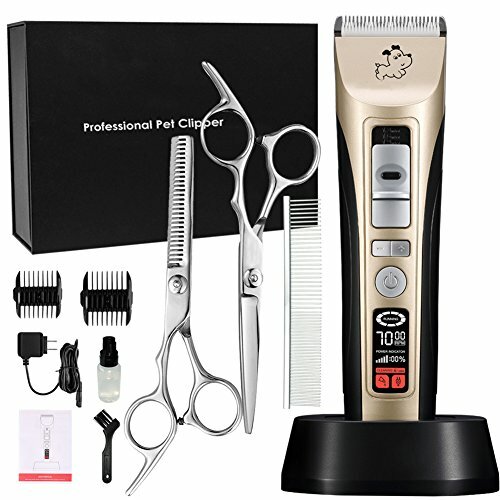 The professional pet clipper has a rechargeable 2200mA Li-lion battery inside. The pet clipper can be used continuously for 4 hours with a full charging time of 3 hours. Such long time power supply is especially perfect for the professional groomer. No matter how thick the hair is, you can do the grooming work with no interruption. ?Intelligent indication of blade oiling and cleaning. The professional pet clipper has a LED screen to indicate users to clean the blade and oiling. When you use the clipper for enough long time, the clipper will remind you to oil the blade to better protect the blade for long term use. When the blade get stuck by hair, the clipper will intelligently remind you to clean it. All the designs are based on user's need and help users to better use it with a wonderful experience. ?Superior Quiet. This professional pet grooming clipper features in its low noise. The sound it produces when working is less than 60 decibels. It has such low noise is because the premium motor it used. Just compare our products to others, you and your dogs will definitely like it! ?Adjustable ceramic and stainless steel blade. This professional clipper has three sizes of adjustable blades of 1.3mm/1.6mm/1.9mm. With this design you can easily decide the length of hair you are going to leave without the aid of comb. The ceramic and stainless blade is one of the most unique feature of our clipper to reduce the heat producing in the grooming process and ensure sharper effect.